Novak Djokovic, who until yesterday was known as the Serb who was ranked the number 1 professional tennis player for both 2011 and 2012 will henceforth be known as the guy who stole our cheese. Djokovic who is clearly at the peak of his career (you really cant go any higher than being #1) has decided on opening a chain of restaurants as his retirement policy. In order to set his restaurants apart,Novak purchased the entire years supply (2013) of the worlds most expensive cheese. So valued is this cheese that it would usually retail for $585 per pound. 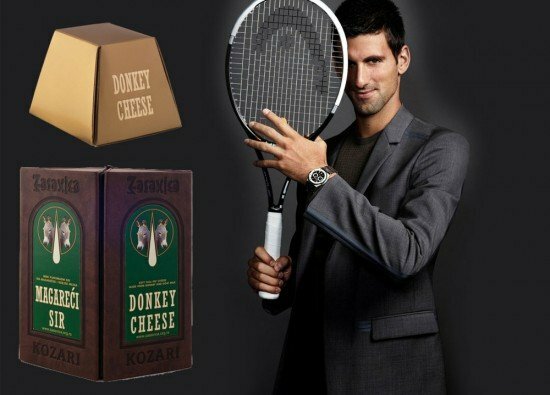 Made from Donkey’s milk , we have but Mr. Djokovics word that it is indeed delicious. This special cheese is made only at the Zasavica farm in Serbia and is the only one that is made from donkeys milk. The cheese which we are told has anti-allergen properties and is a white crumbly one has a distinctive taste due to the fact that the donkeys are raised in a special Serbian wildlife reserve. The cheese will be used in the chain of restaurants that Novak will shortly open. If you do want to try this one out then wait till 2014 or travel to Serbia for that is the only place where the restuarants shall initially open.